Flower Power. 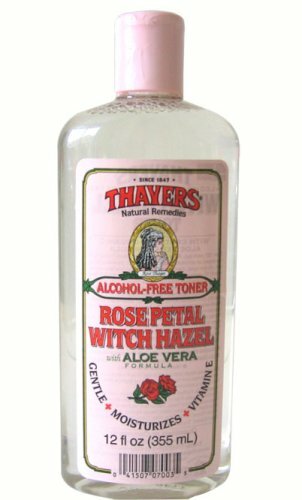 Thayers Rose Petal Alcohol-Free Witch Hazel with Aloe Vera Formula Toner will make your skin bloom. Rose Thayer's remarkably soothing Toner is made with rose-petal water, Vitamin E and our proprietary Witch Hazel extract. Toner with Aloe Vera Formula with Vitamin E 12oz bottle Ingredients: Purified Water, Aloe Barbadensis Leaf (Certified Organic Filet Of Aloe Vera), Glycerin (Vegetable), Fragrance (Natural Rose) Hamamelis Virginiana (THAYERS proprietary un-distilled Witch Hazel) Extract, Rosa Centifolia (Rose) Flower Water, Citric Acid, Citrus Grandis (Grapefruit) Seed Extract, Tocopheryl (Vitamin E) Acetate. Hamamelis Virginiana? We Call It The Shrub Of Life. Made of extract from the Witch Hazel shrub (Hamamelis Virginiana) and a blend of other time-tested ingredients - THAYERS Witch Hazel with Aloe Vera Formula Astringents and Alcohol-Free Toners are soothing, natural treatments that cleanse, tone and soothe your skin. THAYERS are the only Witch Hazel products made of non-distilled extract from the Witch Hazel shrub maintaining the highest levels of therapeutic tannins. These natural elixirs have been a fixture in medicine cabinets for generations. Once you use them, you'll know why. If you have any questions about this product by Thayer's, contact us by completing and submitting the form below. If you are looking for a specif part number, please include it with your message. La Roche-Posay Serozinc Toner for Oily Skin with Zinc, 5 Fl. Oz.